Are you wondering which is the best season to visit the Veneto region? Well, the answer is simple: any time of year! In Spring the hills turn to a multicolored palette of flowers, in Summer the seaside, lagoon and mountain locations organize various activities and events, in Autumn the hills and mountains offer breathtaking views, and in Winter it’s about the right time to discover the typical tastes and flavors of the traditional local products and recipes. 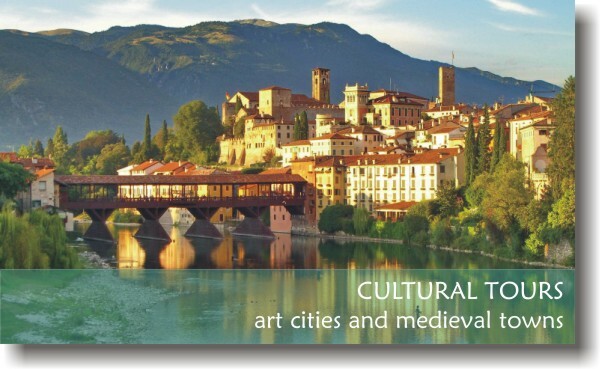 The Veneto art cities and enchanting villages attract for their art treasures and their illustrious archeologists, architects, artists, pioneers, men of letters, musicians such as Mantegna, Palladio, Veronese, Carpaccio, Tintoretto, Tiziano, Tiepolo, Canaletto, Canova, Jappelli, Ruzante, Goldoni, Casanova, Belzoni, Foscolo e Vivaldi; for their Christian Saints such as St Anthony of Padua, or scientists as Galileo Galilei, who here founded the modern scientific theories. The Veneto region is actually made up of historical and medieval walled towns, and places of religious worship that tell of a population coming from the Middle East between 13th and 12th-century BC, who survived throughout the millenniums to the various dominations, barbarian invasions, wars and natural calamities. The Veneto people are indeed simple as well as tenacious, and they hold tightly to their land more than it seems. This territory has nowadays deeply changed, thanks to its wide road and highway network, its shopping and trade districts, its industrial areas. It is only, though, amongst its many Piazzas, Villas, Castles, Palaces, Churches, Porticoes and Gardens that you will experience the truest side of the Veneto region.